Facebook fans are 2.5 times more likely to place an order and spend an average of 20% more on each order than non-Facebook fans (JDN). If you don’t have a Facebook page yet then it’s time you got one. Here are 3 ways to use Facebook to market your online shop. 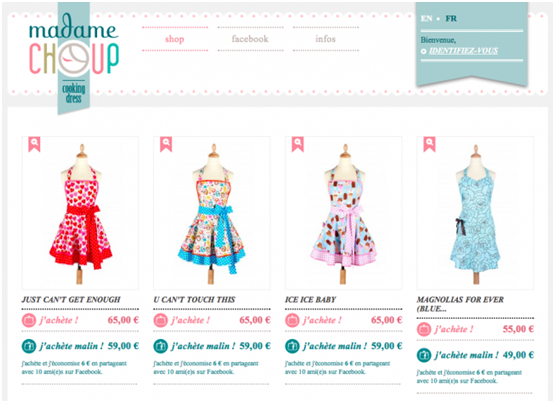 The Madame Choup website has implemented a great technique to attract relevant traffic to its online shop. Internet users save 6 Euros when they share their purchase with 10 of their Facebook friends. This technique works because the internet user is happy about the discount and carefully picks which friends to share it with. The 10 chosen people are usually the shop’s target audience. This strategy doesn’t just drive traffic to the website, it also attracts customers who are likely to buy from you and become loyal customers. It works like a referral as it attracts customers who have been introduced to a product following a customer referral. Madame Choup won the Marketing-Communication Award for this strategy at the latest PrestaShop Awards. Create a shop window on your brand’s Facebook page to promote your products and your new offers, as per Dior’s Facebook page below. 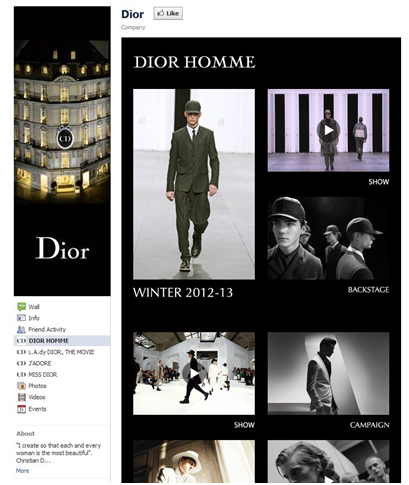 The brand also presents its new 2012-13 collection in photos and videos on its page to reflect its luxury brand position. The Zadig & Voltaire website isn’t the only place where you can view its product catalogue; there are short product pages with photos, prices and descriptions on its Facebook page. 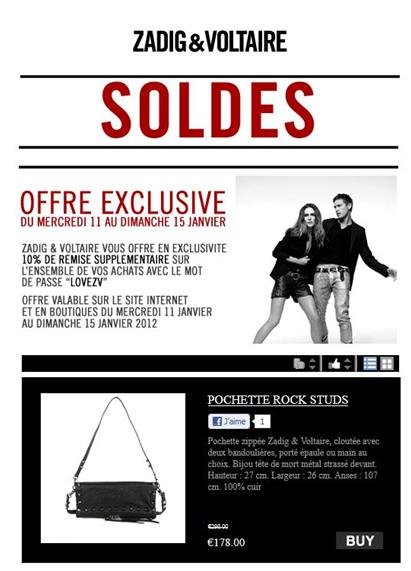 When the visitors click “buy” on Facebook, they are redirected to the product page on Zadig & Voltaire’s online shop. The goal: to generate traffic and revenue from Facebook. The brand also highlights the benefits of following its Facebook page to the visitor. The goal: to get as many Facebook users as possible to keep up to date with the brand’s news on its profile and be the first to hear about its promotions and offers. 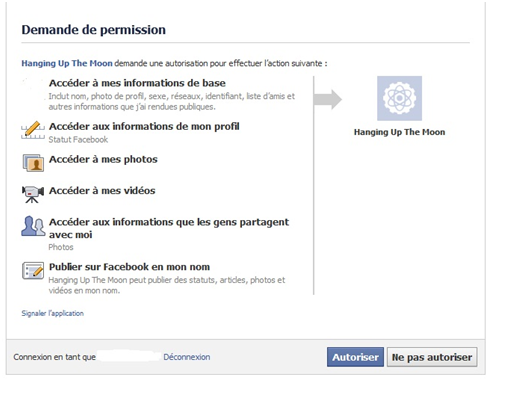 The www.hangingupthemoon.com website has another way to use Facebook for marketing. The shop has two ways to download Sean Lam’s Hanging up the Moon album. The first and fairly common way is to pay at least 1 dollar to download it. The second more original way is to download the album for free in exchange for information about the user from Facebook (access to profile, photos, videos etc.). 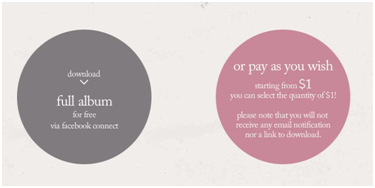 The website can then use this information to send personalised offers and emails. As you can see, Facebook provides a multitude of marketing opportunities for your online shop. Like Madame Choup, many online shops are getting more inventive and finding new ways to use Facebook and other social networks to their advantage. 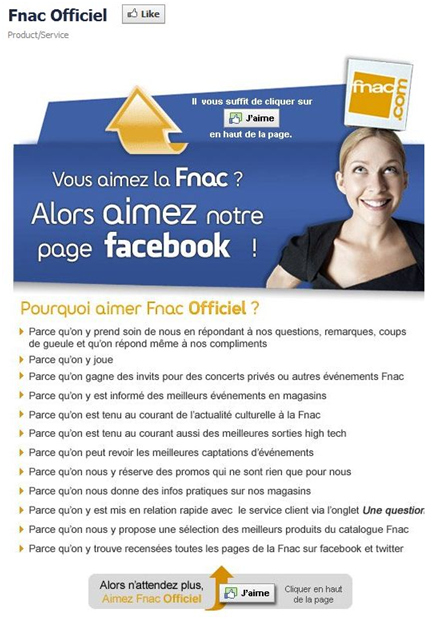 Now it’s time to get on Facebook and try out at least one of these tips! 4 Tips to Secure Customer Loyalty! Highlight the quality of your services! 8 Tips for a Successful Email Campaign! 6 pieces of advice for starting the year on the right foot!